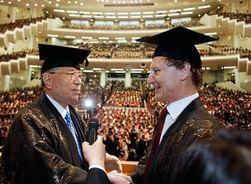 We have collated our mentor, Dr. Ikeda's accolades over the world and segregate them into continentals for easy viewing. We hope this will give everyone an easy access to know which countries and how many awards our mentor have achieve. This will be kept for eternity, a remembrance of our great mentor in life and his effort for his mentor and his disciples. Till now, there are a total 354 Honorary awards given to our mentor, Dr. Ikeda. These awards are broken into different continentals and are as follows. 1. Taiwan to confer the 322nd Honorary Awards to President Ikeda! Taiwan’s 11th for President Ikeda!